(Bloomberg) -- Just hours after attempts to deliver humanitarian aid to Venezuela failed, the country's opposition and U.S. allies suggested a more forceful multilateral move against Nicolas Maduro's autocratic regime. Juan Guaido, the president of Venezuela's National Assembly, said that he'll meet Monday with officials from countries in the region backing his push to topple Maduro and announce the next steps afterward. While he didn't specify what those steps could be, he did say in a series of tweets that "all options" are being considered. Shortly thereafter, Senator Marco Rubio, who's helped spearhead the U.S. position on Venezuela, posted a tweet showing Panamanian dictator Manuel Noriega under arrest in the U.S. in what was a not-so-subtle threat to take Maduro out militarily. Guaido will meet with U.S. Vice President Mike Pence before huddling with the Lima Group, a coalition of a dozen countries in the Americas committed to regime change in Venezuela, according to a person familiar with the matter. After Saturday's developments, "I've been forced to take a decision: formally propose to the international community that we should have all options open to achieve the liberation of this motherland which is fighting and will continue to fight," Guaido said on his Twitter account. "Hope has been born to never die, Venezuela." Guaido is walking a delicate line. While saber-rattling could unnerve some in the top ranks of Maduro's military and speed up defections, threats of foreign military intervention, especially involving the U.S., would likely strengthen Maduro's stance among his shrinking base at home. He has already been characterizing the aid deliveries as little more than a pretense by the U.S. and others to invade Venezuela. Secretary of State Michael Pompeo said on Sunday that more needs to be done and didn't rule out military action. But he downplayed the setbacks on Saturday, saying that history can be slow and unpredictable. He recalled his experience as a young soldier on the border of East Germany. "No one predicted on that day in 1989 that that wall would come crumbling down," Pompeo said on CNN. "I am confident that the Venezuelan people will ensure that Maduro's days are numbered." To repel the efforts to bring food and medicine into Venezuela, Maduro closed his borders with Brazil, Colombia and Curacao while positioning military and pro-government armed militias near the crossing points and in border towns to push back and intimidate opposition supporters and aid volunteers. With Maduro insisting that Guaido is using humanitarian aid as an excuse for intervention, the opposition maintains that it is simply part of efforts to relieve a malnourished and suffering population in the throes of Venezuela's worst ever economic collapse. Saturday brought violent action but little motion. Maduro avoided a bloodbath despite a massive border face-off between protesters and soldiers. His army didn't desert him. While Guaido failed to start the flow of relief, he demonstrated vividly that the regime would attack its own citizens and spurn food even as people starve. At least four have died in chaotic clashes and about 60 members of the armed forces defected along the borders of Colombia and Brazil, where food and medicine is stockpiled. But Saturday ended much as it began: Trucks of humanitarian aid donated by nations backing Guaido's bid for power idled just outside the country and Maduro resumed taunting his rivals, crowing about victory back in Caracas. "I am stronger than ever," the socialist strongman said in an impassioned and expletive-laden speech that whipped die-hard supporters into a frenzy. "Standing, ruling our homeland, for now, and for many years." "We saw today a man who doesn't care about Venezuela, ordering to burn food for the hungry and medicine in front of the sick," Guaido told reporters, adding that Maduro "has chosen the worst of paths, the path of crime and extermination." "Venezuela's military has a choice: Embrace democracy, protect civilians, and allow in humanitarian aid; or face even more sanctions and isolation," National Security Adviser John Bolton wrote on Twitter. Saturday's clashes on the Colombian border injured 285 people, mainly harmed by tear gas and "non conventional arms," according to Carlos Trujillo, Colombia's foreign affairs minister. Thirty-seven were hospitalized. The push from Colombia began Friday with a music festival organized by Sir Richard Branson in the border town of Cucuta, which drew more than 300,000. Many remained and early the next morning began confronting Venezuelan troops stationed on the area's four international bridges. In late morning, 14 trucks of aid began leaving a warehouse and rolling slowly toward the bridges, with dozens of Guaido supporters on top waving Venezuelan flags and chanting "Freedom!" and "Yes, we can!" On the Simon Bolivar Bridge, Guaido's supporters approached a phalanx of Venezuelan guardsmen, trying to get them to clear a path for the delivery. Instead, they fired tear gas. On another bridge, two aid trucks approaching the Venezuelan side were promptly set on fire as volunteers frantically unloaded their cargoes. In Urena, standoffs grew into a full-scale urban battle. Guardsmen fired tear gas on Venezuela's Women in White, a religious group that tried to reach a crossing. As elderly women and nuns gasped, demonstrators barricaded streets with burning tires and hijacked red government buses -- setting one ablaze -- to use as battering rams to break the line of soldiers guarding the bridge. 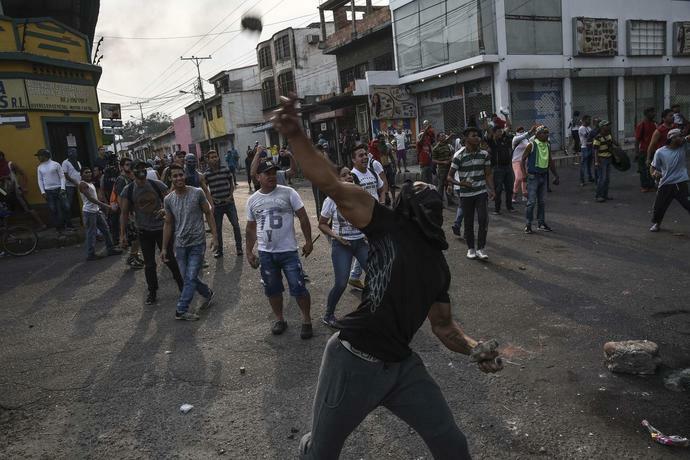 In San Antonio del Tachira, masked members of the colectivos, pro-Maduro paramilitary gangs, terrorized white-clad Guaido supporters, zooming through streets on motorcycles and firing pistols into the air. Residents dove into doorways or burst into strangers' homes. Medics tending to the wounded crouched and raised their hands in the air. The violence wasn't restricted to Cucuta and its satellites. In a remote area of Venezuela near a border crossing into Brazil, there were deadly clashes. Shooting broke out in the town of Santa Elena de Uairen as troops tried to control the area. Three people died Saturday and one Friday, said Alberto Brito, the head of the local disaster relief agency. At least were 34 wounded. Venezuelan ambulances carrying victims to Brazilian hospitals were the only vehicles allowed to cross the border point of Pacaraima, Brazil. Nowhere did aid get through in significant quantities. In Pacaraima, two aid trucks made it to a border zone that is technically in Venezuela, but went no farther. Tomas Silva, a Guaido representative, told reporters that they put plans to cross on hold and that a camp may be built at the crossing point until the aid is allowed to enter. A ship carrying humanitarian aid from Puerto Rico had to abandon the area after threats of bombardment from the Venezuelan navy, according to a statement from the governor's office of the U.S. commonwealth. We have "notified our partners in the U.S. government about this serious incident. We are in talks to determine the best course of action moving forward," Governor Ricardo Rossello said in a statement. The day's rage died hard. A member of the Venezuelan national guard was surrounded by lynch mob on the bridge to Urena about 7 p.m. Colombian police took her away in a patrol car to save her life. Two aid trucks burned to their chassis on the span, illuminating the night as demonstrators torched a huge poster bearing the face of Maduro. --With assistance from Patricia Laya, Jonathan Levin, Alex Vasquez, Fabiola Zerpa, Daniel Cancel and Alyza Sebenius.